Go to A205 to work on the research paper. It is due Friday. Here is a document that will help you with formatting. And this will help you with Works Cited Pages. Wednesday Wisdom: Comfort Zones. Watch the video and answer the quick write questions in your notebook. How big do you consider your comfort zone to be? How often do you go outside of your comfort zone? What is something you can do that will put you out of your own comfort zone and will have a positive impact on your life? Assignment: In your notebook, explain which Story Shape you think applies to Of Mice and Men. Draw the story shape and show were events from the story take place on the curve. (use 4-5 events). Then choose any 3 of Vonnegut’s Story Rules and explain if Of Mice and Men follows each rule. Give evidence of actual events from Of Mice and Men to support your answers. Go to A205 to work on your research paper. Remember, it is due Friday! Check out this document to help with formatting. We will finish our notes on Vonnegut’s Story Rules. The research paper is due Friday. Work on it in Google Docs. Today we are in our classroom. Tuesday, Wednesday, and Thursday we will be in A205; and Friday we will be in A206. Here are some helpful Transitional Phrases that can be used to introduce, conclude, and move through ideas in your writing. PowerPoint version. 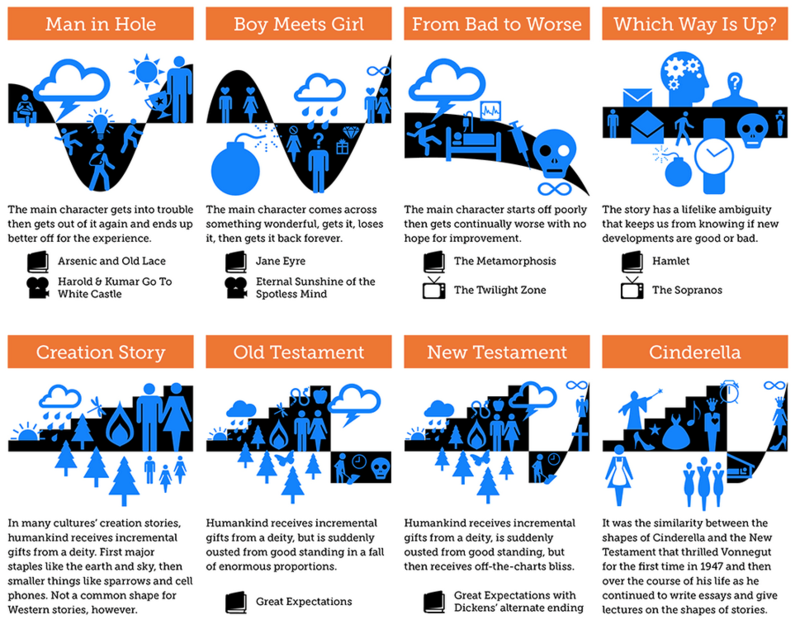 We will take some notes on Kurt Vonnegut’s Shapes of Stories, and Story Rules. The rest of class will be spent reading. You will be graded in two ways: First, for having something to read. Second, for actually reading, without talking, sleeping, or being distracting to others. Using any of the Pixar shorts we have watched this week, complete the following assignment. not simply summarize the film. Do not give a plot summary! REMEMBER! Bring something to read with you to class tomorrow. Today we will learn how to do the Works Cited Page and Parenthetical Citations for direct quotes and paraphrasing. In your notebook, complete the plot diagram (Freytag’s Pyramid) for these two Pixar shorts. Then write down what you think the theme of each is. On Thursday, I will check that you have plot diagrams and themes for all four Pixar shorts we watched this week. Go to Room A206 to finish your topic sentences worksheet. I will collect it on Thursday. Go to A205. We are working on our outline for the research paper. Here is the document you will be turning in by tomorrow. Complete the Plot Diagram for “For the Birds.” In your notebook, write what you think is the theme and what elements from the plot helped you find this theme.